Interior Features Three bedroom, two bath, Puu Alii townhome with new kitchen featuring granite counters, new cabinetry, and new flooring throughout. Desired floorplan with covered lanai, large master bedroom, split air conditioning, laundry area, and garage. 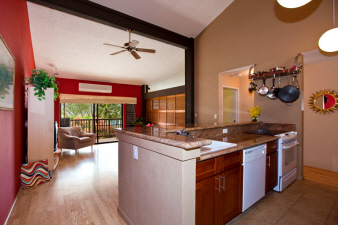 Enjoy the heated pool, sauna, tennis courts, and walking paths within the complex. Convenient location to Windward Mall, shops, restaurants, military base, and more!